In my previous articles, I explained how to create and configure the FILESTREAM feature in SQL server instance. Moreover, I demonstrated how to create a table that has a FILESTREAM column and hot to insert and delete the data from it. In this article, I am going to explain how to backup and restore the FILESTREAM-enabled dataase. Moreover, I am going to demonstrate how to restore FILESTREAM filegroup without making database offline. As I explained in my previous articles, when we enable FILESTREAM on SQL Server instance, we need to create a FILESTREAM container that has the FILESTREAM filegroup. When we backup the FILESTREAM-enabled database, backup of the FILESTREAM filegroup will be included into the backup set. When we restore the database, SQL Server will restore the database and the FILESTREAM container and files within it. Backup all available data files of the database. Backup the FILESTREAM filegroup and files within it. SQL Server gives the flexibility to take backup of the FILESTREAM container only. If files within the FILESTREAM container get corrupt, we do not need to recover the entire database. We can restore just the FILESTREAM filegroup. Explain how to take a full backup of the FS database and backup only the FILESTREAM container. Explain how to restore the FILESTREAM-enabled database. How to restore the FILESTREAM container online and offline. Note: SQL Server Enterprise edition and developer edition supports ONLINE restore. 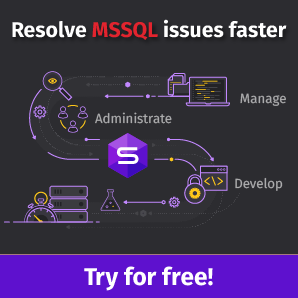 Software: SQL Server management studio. To demonstrate the backup process, I have created a FILESTREAM-enabled database named FileStream_Demo. It has a FILESTREAM table named Document_Content. Backing up a FILESTREAM-enabled database is a straightforward process. To generate a full backup of it, execute the following T-SQL script. /*Begin Backup DataFile*/ Processed 568 pages for database 'FileStream_Demo', file 'FileStream_Demo' on file 1. <strong> /*Begin backup of FILESTREAM container*/</strong> 10 percent processed. 20 percent processed. 30 percent processed. 40 percent processed. 50 percent processed. 60 percent processed. 70 percent processed. 80 percent processed. 90 percent processed. Processed 111106 pages for database 'FileStream_Demo', file 'Dummy-Documents' on file 1. <strong>/*Begin backup of FILESTREAM container*/</strong> Processed 4 pages for database 'FileStream_Demo', file 'FileStream_Demo_log' on file 1. 100 percent processed. BACKUP DATABASE successfully processed 111677 pages in 18.410 seconds (47.391 MB/sec). Processed 568 pages for database 'FileStream_Demo', file 'FileStream_Demo' on file 1. Processed 111106 pages for database 'FileStream_Demo', file 'Dummy-Documents' on file 1. Processed 4 pages for database 'FileStream_Demo', file 'FileStream_Demo_log' on file 1. BACKUP DATABASE successfully processed 111677 pages in 18.410 seconds (47.391 MB/sec). As I mentioned at the beginning of the article, first, SQL server takes backup of the Primary datafile then secondary data files and lastly, Transaction logs. As you can see in the backup log, Firstly, SQL server backup Primary datafile then FILESTREAM filegroup and data associated with it and finally transaction logs. As I mentioned at the beginning of the article, we can also generate a backup of the FILESTREAM container. To create a backup of the FILESTREAM container, execute the following T-SQL script. When we restore the FILESTREAM database, SQL restores FileStream container along with all files within the FILESTREAM container. In SSMS, right-click the database and select Restore Database. In the Restore dialog box, select Device and click Browse. Another dialog box will open, In the dialog box, click Add. In the Locate Backup File dialog box, navigate through the directory structure, click a proper backup and click OK.
Once the backup information loads in the Backup sets to restore grid view, click OK to start to restore the process. The FILESTREAM filegroup restores process like the process of restore filegroups. To generate the restore scenario, create a FILESTREAM-enabled database named FileStream-Demo. The database has a FILESTREAM table named Document_Content. Insert some random data and files in the Document_Content table. Execute the following query to populate details of files inserted in the table. Firstly, generate a full backup of the database. For this, execute the following command. Now, we need to restore the FILESTREAM container to fix this error. We generated a full backup and backup of the Dummy-document filegroup. Offline restore of FILESTREAM filegroup. Online restore of FILESTREAM filegroup. Using SQL server enterprise edition, we can restore the backup when the database is online. For example, if a file F1 of secondary filegroup FG-1 is corrupted, then we can restore file F1 while the database remains online. Restore sequence of offline restore, and online restore are same. As mentioned above, to perform an online restore of FILESTREAM filegroup, make the Dummy-Document datafile offline. For this, execute the following command. Execute the following command to restore the last T-Log backup. How to take backup and restore the FILESTREAM-enabled database and FILESTREAM filegroup. How to restore FILESTREAM filegroup online and offline.